Movie Review: New York-based filmmaker, Alex Ross Perry, proves to be one of the most lucid and audacious storytellers of our time. After an examination of personal dissatisfaction and ego in the absorbing “Listen Up Philip”, Mr. Perry distinctively crosses a difficult, dramatic barrier in his latest “Queen of Earth”, a meditation on depression and how it can devastate relationships. Even before the opening credits, we are shown a close-up of the terrific actress Elisabeth Moss, in a disconsolate state; the tears roll down her face, blurring the make-up around her sad eyes. She plays Catherine, an artist wannabe who always lived in the shadow of her father, a renowned artist from New York who died recently. Despite the persistent pain associated with that loss, she cries because her dishonest boyfriend, James (Kentucker Audley), just announced the end of their relationship. In the next scene, we’re transported to a house in Hudson Valley that will serve as a one-week refuge for Catherine and her best friend, Virginia (Katherine Waterston), to spend a good time together like they did one year before. Yet, nothing is the same now since Catherine seems alienated, many times confined to her dark room, sleeping too much or too less, eating junk food, and saying she’s not in the mood for talking due to some stupid reason. Their relationship deteriorates even more when Virginia starts bringing the boy next door, Rich (Patrick Fugit), into the house. The provocative Rich is not well tolerated by Catherine, who gets somewhat jealous and uncomfortable with his frequent questions, insinuations, and unnerving posture. She feels more and more insecure, abandoned, and neurotic, eventually losing the little emotional control that she’s still able to find during a tremulous private party at the house. Flashbacks from one year before helps us understand how the things were and how they stand now. 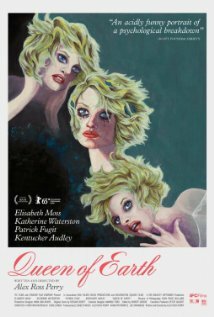 Perry’s direction is practical without being obtuse, finding consistency in a script that digs deep into the characters’ soul, and managing to turn the cutting, claustrophobically tense “Queen of Earth” into a modern version of “A Woman Under the Influence” with traces of Bergman.